Early on, however, I had concern. The performance began with The Dance of the Comedians by Bedrich Smetana (you might know this as the roadrunner theme). Although bows seemed to effortlessly glide over strings as the symphony deftly tackled this piece in vivace, the sound seemed almost one-dimensional and muted. But juxtaposed with the following Warner Brother theme and Looney Tunes introduction, it made for an amazing contrast. Suddenly the horns and percussion were unleashed–and thankfully there was no going back. One of the highlights of the evening was the symphony’s performance of the accompaniment to a roadrunner cartoon, when it was brought back a second time later in the evening. The piece Zoom and Bored was written by Carl W. Stalling and Milt Franklyn and is based on The Dance of the Comedians. 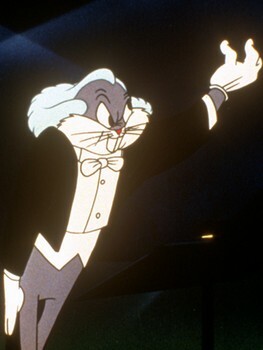 The symphony was perfectly synchronized with the cartoon, using instrument to not only show the silent characters’ emotions and motivations, but also to create sound effects for the calamities that fall upon poor Mr. Wiley Coyote. Equally as impressive were the performances of The Rabbit of Seville, based on Rossini’s The Barber of Seville (where Bugs gives Elmer Fudd a revenge-worthy shave and a haircut); What’s Opera Doc based on a collection of pieces from Wagner’s most popular operas (where Elmer Fudd as a viking is seduced by Bug in drag and then vows revenge when discovering Bug’s true identity); and Long-Haired Hare with an original scored by Stalling based on works by Wagner, von Suppe, Donizetti, and Rossini (where Bugs seeks revenge against an opera singer). Although the symphony did a spectacular job, there were a few hiccups. They struggled early on in their performance of Rhapsody Rabbit, where the synchronization with the cartoon was off by about half a beat. It was so bad that the timpani, which was clearly meant to provide a sound effect for the fall of a particular character on screen, struck its head one full beat after the impact on screen. This performance, however, was not without merit. Half-way through, Bugs and the orchestra break out into a jazz act. Think of your favorite jazz musicians playing some feet tappin’, head bobbin’, and body swaying jazz in a smoky hole-in-the-wall joint. Now think about that same sound amplified by an entire symphony orchestra with some of the best musicians in the world. Yeah—it was awesome. 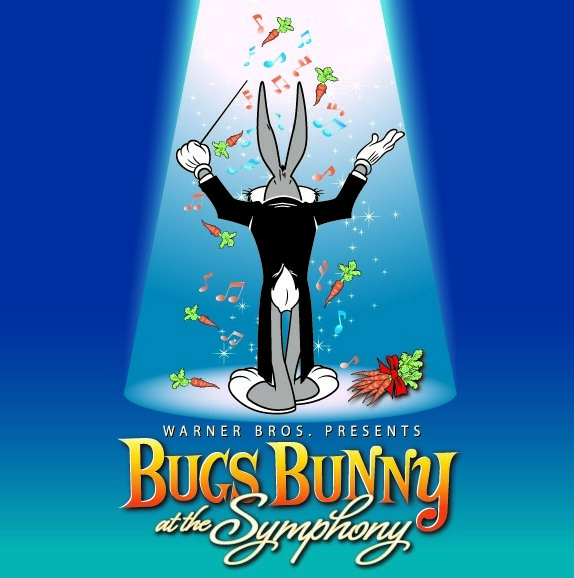 Also, in Act II, the symphony moved away from Looney Tunes and paid homage to other Warner Brother cartoons (i.e. Tom and Jerry, The Flinstones, and Scooby Doo). Although the music in the Tom and Jerry short from Johann Srauss’s Die Fledermaus was outstanding, the Scooby-Doo and Flinstone homages seemed like filler. Where all the other pieces were integrated with the media, here, they only provided montages of Scooby-Doo and Flinstone footage. They paired Scooby with the ever-identifiable In the Hall of the Mountain King by Edvard Grieg and the Flinstones with the Can-Can by Jacques Offenbach. The DSO performed these pieces masterfully, but with the wealth of great orchestral scores gracing the Looney Tunes annals, this brief interlude seemed misplaced and poorly chosen. Regardless of these complaints, the evening was a wild success. 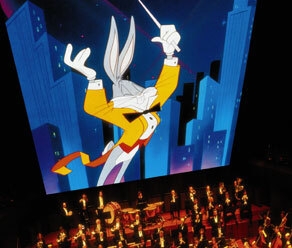 The DSO allows the audience the opportunity to see these cartoons the way they were meant to be seen –on the big screen. But it provides us with something even more rare. Only a handful of people, including Chuck Jones, got to see these cartoons with a live symphony orchestra before the music was recorded. We get the opportunity to stand in Chuck Jones shoes and hear the music at the forefront. It adds a whole new dimension to these iconic films as they continue to bring us laughter. CLICK HERE to get tickets for the last show today at 2:30pm, or you can check out what’s coming up at the Dallas Symphony Orchestra. This entry was posted on Sunday, October 7th, 2012 at 11:38 am	and is filed under Events, Music, News. You can follow any responses to this entry through the RSS 2.0 feed. You can skip to the end and leave a response. Pinging is currently not allowed. « Bryan’s Review of ‘Frankenweeine’!!! [on the News] I sell cheap books, I do. So sue me. Well, yeah. That's not *all* I said. I can't believe those bastards! I said we were great, I said you could sit and read for hours and no one will bother you. I said we have a hundred and fifty thousand titles. I showed them the New York section. I said we were a goddamn Piazza! A place in the city where people can mingle and mix and be.